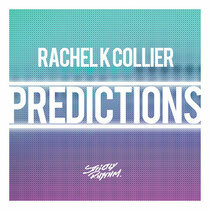 Rachel K Collier provided the vocals for Ray Foxx’s track ‘Boom Boom (Heartbeat)’. One of the memorable songs of the summer, the track was the latest in a series of collaborations for the 23-year old self taught grade 8 pianist and alumni of the Royal Welsh School Of Music. Since moving to London in 2012 from her native Wales, Rachel has been busy writing and recording with an array of UK producers including Lung, Wookie, Netsky, Mutated Forms and Mat Zo. Now stepping out into the spotlight, she debuts with her solo single ‘Predictions’. Produced by London duo Blue Slims, ‘Predictions’ is a bass heavy, club groove juxtaposed with Rachel’s songwriting and subtle vocal delivery. Along with the original, remixes are included from DJ S.K.T (producer of the remix of Miguel’s ‘adorn’) and rising London based producers, Billon. Already the recipient of a Radio Ripper gong from 1xtra’s Mistajam, picked as Sarah Jane Crawford’s Record of The Week, and hailed as the ‘Best of British’ by Radio 1Xtra’s TwinB and Yasmin Evans, the track should highlight the Welsh as one to watch for 2014. It’s out now on Strictly Rhythm, check it below.